Uproot NYC packed up and headed out to sunny California to see where the wine is made. 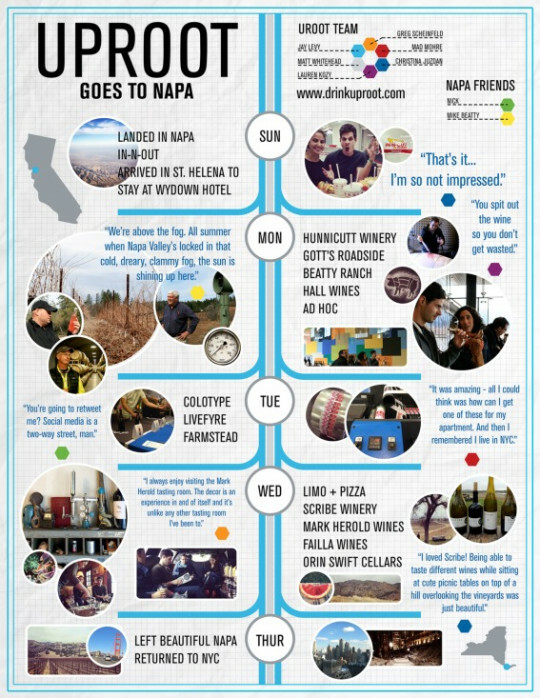 We had so much fun that we decided it needed its own infographic. Highlights of the trip included stops at our shipping facility, a visit to where the wine is made, the labeling factory to oversee the creation of the Rosé (!) labels, and playing host at the Livefyre offices for a tasting happy hour. Oh yeah, while we were “working,” we ate in some pretty fantastic restaurants and spent an entire day wine tasting at various wineries throughout the valley – all in the name of research, of course.